Tatoosh Rye hits it just right with a classic recipe, small-batch distillation in copper pots, and a jigger of fun that produces a balance of sweet and spice with a hint of strawberry that I haven’t seen before in a Rye. In 2009, Troy Turner rediscovered his roots. It seems that his great-great grandfather was run-out of Louisiana for moonshining. He rode the rails to the West Coast—Seattle—and settled down. From then on he kept things mostly legal, but distilled enough for “personal consumption.” Well, that’s their story and they’re sticking to it. They started with a single-malt Whiskey, then added Bourbon and Rye to the menu. Small batch distilling in copper stills, local ingredients, proper aging in American Oak, and a jigger of fun make up their entire line. 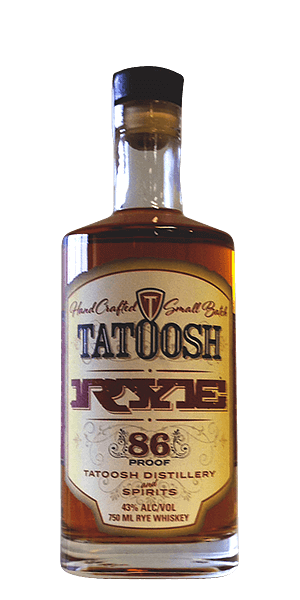 Rye is Tatoosh’s newest product, arriving on the market in late 2014, but it is already making waves and winning awards. heir Rye is comprised of 70% Rye grain mash, with corn making up the rest. So it is a dead-on classic (and winning) combination of flavors. You get all the spice you expect from a rye, but it is balanced with the natural sweetness of the corn. They hit it just right, and actually manage to achieve a hint of strawberry on the pallet and finish that I have seen before in a Rye. What the heck is a “Tatoosh” anyway? Well, back in the 1800’s, a pidgin trade language sprang up as a combination of French, English, and local native American dialects called “Chinook Jargon.” There is a Tatoosh Mountain Range, Wilderness area, Island, and various other things. Let’s just say that there is a long history of lonely frontiersmen naming rocky outcroppings after, um … the female anatomy and leave it at that. What does Tatoosh Rye Whiskey taste like? The Flavor Spiral™ shows the most common flavors that you'll taste in Tatoosh Rye Whiskey and gives you a chance to have a taste of it before actually tasting it. Long and warm … and is that strawberry? Tais toi... Callate la boca... Halt die klappe!!! Shut your mouth! Tatoosh is just plain good! Not impressed. Very weak for what I would expect in a rye. It’s got a lighter taste then many other Rye I have tried. Subtle. It doesn’t make it better, just a tad smoother.